It’s barely been a month since Aurelion Sol was released for League of Legends, but there’s rumbling that another playable champion is on the way. Update 17 May, 2016: Taliyah’s champion spotlight video has finally been revealed, just ahead of her release in tomorrow’s patch. See Taliyah at her best in the champion spotlight video below and get ready to unleash her rock-based powers once patch 6.10 lands tomorrow. For the full lowdown on the patch, including release times by region and balance tweaks, check out our LoL patch 6.10 post. Update 03 May, 2016: The mystery has been excavated and all has been revealed for our new, cobble-conjuring champion, Taliyah. Rock Surfing allows Tailyah to – you guessed it – surf on a rock. Well done you. When rock surfing she can build up speed while near walls, but this passive can only be used outside of combat. Taliyah’s Q, Threaded Volley, has her rip up the ground around her, firing a volley of five stone shards in a target direction while moving freely. Siesmic Shove is Taliyah’s W, and it’s a slightly delayed shove up the back end. Nice. Taliyah scatters boulders onto the ground before her, with Unraveled Earth, her E. Opponents who dash through the fractured earth take damage from an explosion. After a few seconds, any remaining rocks in the field erupt, dealing a second wave of damage. Double ouch. Weaver’s Wall, Taliyah’s R, allows her to summon a wall of spiralling rock that shoots through the Rift towards a target. She can also ride it and it looks really cool. For the full lowdown on Taliyah, head to her official Riot champion page. Update 03 May, 2016: A teaser trailer suggests our rubble-bothering magician is coming sooner rather than later. Riot have now released a sub-minute animated clip featuring Taliyah, which makes reference to a desert “homecoming”, showcases her geo-magical capabilities, and suggests she’s bound for the upcoming Mage update. Before you can learn the future, you have to accept the past, or something like that. Whatever. Take a look at our guide to the best League of Legends champions. Taliyah’s Q, it seems, is an ability that allows her to stare down quantities of sand that would have the rest of us swearing and blinking out grains for hours. More seriously, she’s clearly able to unearth rocks to do her bidding – raising intriguing possibilities for crowd control (as well as, you know, hitting other champions with boulders). Original article 28 April, 2016:The trail starts with a short story Riot posted on the official League of Legends website called “The Bird and the Branch“. It follows a young woman named Taliyah, a mage from the land of Shurmia who can control stone. One thing leads to another, and Taliyah learns to master her powers of stone control…. Stonemancy? 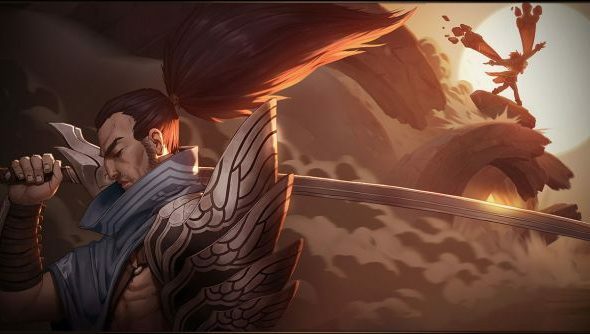 Then she teams up with swordsman and existing character Yasuo. Riot hasn’t outed Taliyah as a new playable champion, but the fact they’ve knocked art together and focussed on this as-yet unknown character would suggest such. There’s a big mage-focussed update coming that our lad Ben dissected for your pleasure. I mean, if I were aiming to release a mage character, an update called the Mage update is probably how I’d do it. Of course, I don’t work for Riot, so take everything we’re saying here with a pinch of salt, and if we get any more information, we’ll bring it to you as quick as we can.